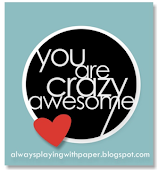 Happy Thursday my blogging friends. It is time for a new challenge over at Seize the Birthday and this time we have the "toppings" option of making a monochromatic yellow card. It took a little thought but I am happy with the way my card turned out. 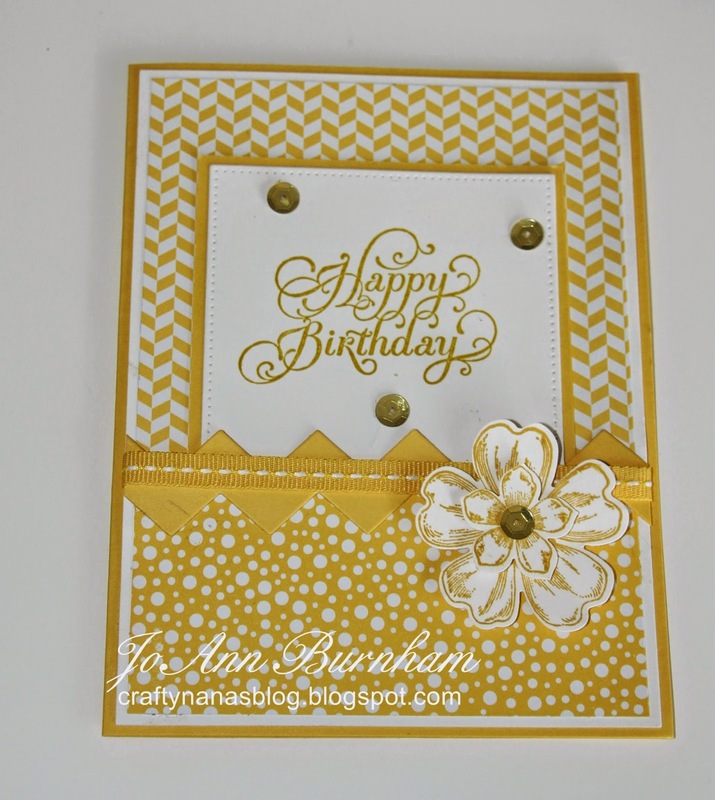 I used three yellows for my card: Daffodil Delight - card base & mat, DSP from SU All Abloom, ribbon, and chevron border cut with MFT Chevron Stripes die; Summer Starfruit ink for the SU Beautiful Birthday (ret.) sentiment; and the new SU Hello Honey ink for the flowers from Flower Shop and Petite Petals, which are mounted with foam dimensionals. 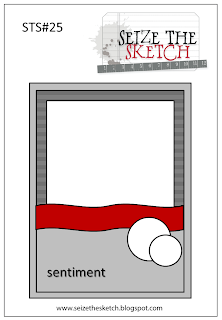 The sentiment panel is cut with MFT Pierced Rectangle Stax dies. I added a few gold sequins on the sentiment panel and the center of the flower. I used the current Seize the Sketch #25 layout. 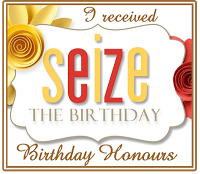 Now check out all the fabulous creations by my fellow Design Team members over at Seize the Birthday. Hope you can play along with us, can't wait to see what you will create this week. This is my card for this week's My Favorite Things card sketch #186. I missed the last two weeks and was happy I got it done this week. 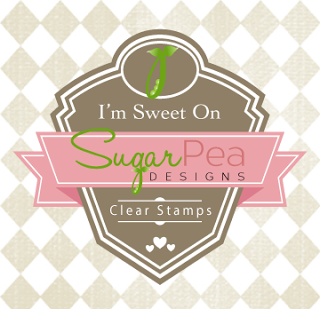 All products are from MFT except the two SU Certainly Celery leaves and the DSP from Echo Park's Summer Bliss 6x6 pad. I used MFT Sweet Tooth and Natural CS, Upsy Daisy, Fishtail Flags Stax, Pierced Circle and Circle Stax 2 die-namics. The sentiment is from LJD Gift Card Greetings II. The daisy and sentiment panel are mounted with foam tape. I really like the way it turned out. There is a special reason that it is a Thank You card as it is going in the mail to Kim van der Sanden (owner of MFT) and Jody Morrow (Design Team). My friend and I went to a class at MFT on Saturday and I was surprised to meet Kim and Jody. They said they came in just to meet me as they aren't usually there on Saturdays. I also met Kim's husband and youngest daughter and Jody's daughter. Kim said they heard I had a rough year due to my recent family tragedy and wanted to do something nice for me. 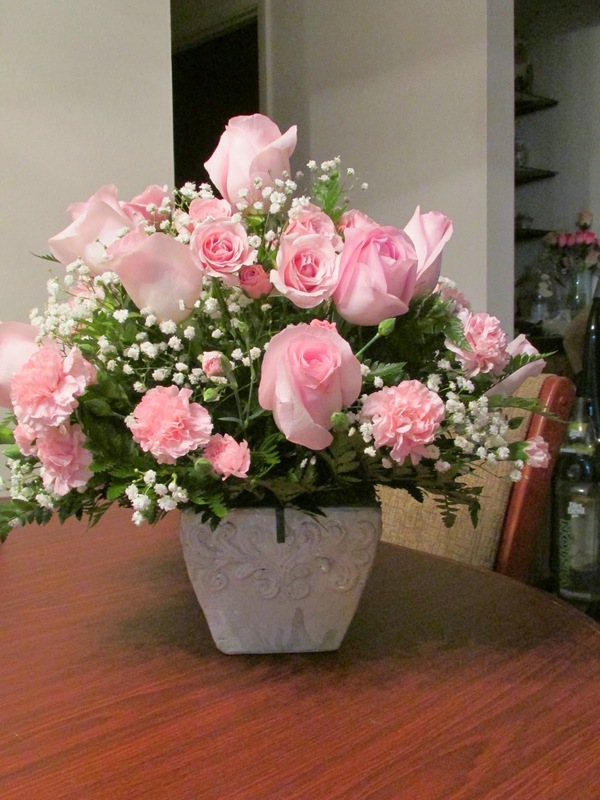 They had this beautiful bouquet of pink roses and carnations and also a gift certificate to the store. I was so surprised and happy that my eyes were a little weepy. Needless to say I did some happy shopping. It was a wonderful day. 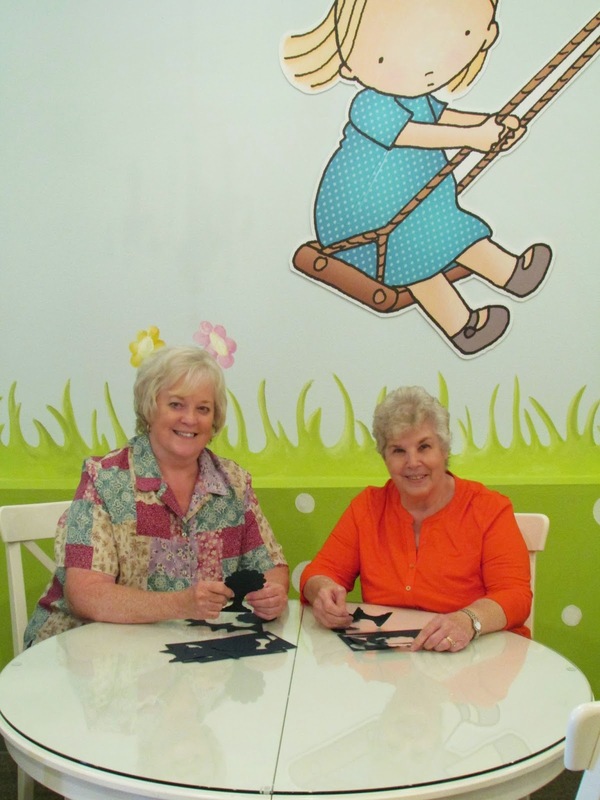 Barb and I in the adorable MFT classroom. Sorry my post is so long, but I had to share this happy day. Happy Friday my friends. 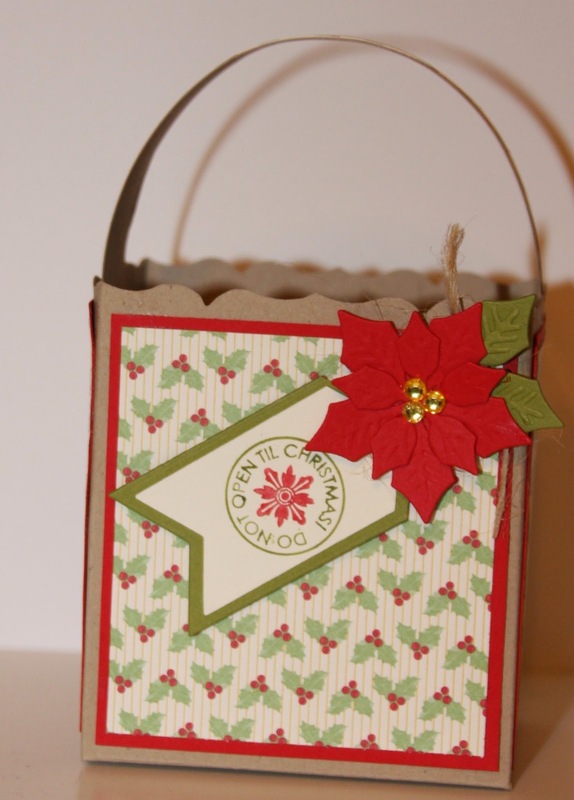 This week's challenge at Christmas Stampin' All Year Long is to make a gift set. No sponsor this week. The winner will be a guest designer in October. Here is my little gift box and matching Christmas card. The box and card base are SU Crumb Cake. The mats are SU Real Red, the banners are Old Olive and Very Vanilla. 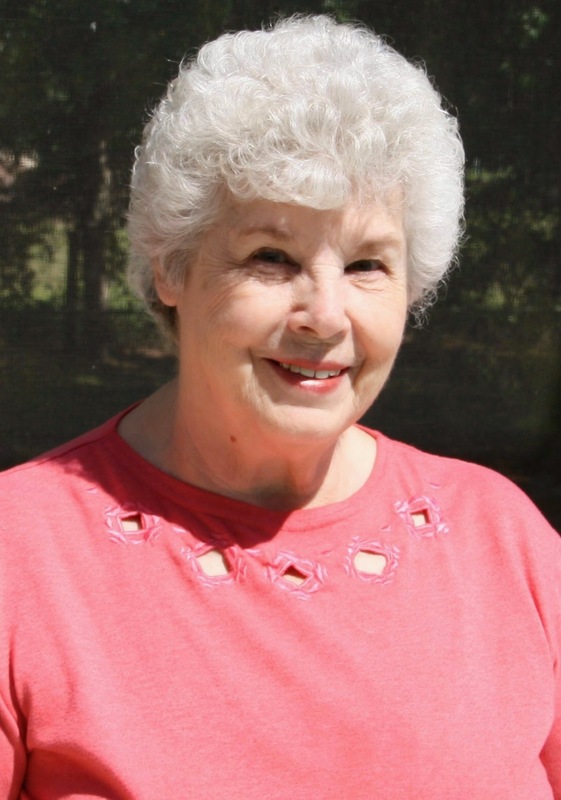 The DSP is from SU Holly Berry Bouquet (retired). The poinsettias are made from Spellbinders Layered Poinsettia with Real Red and Old Olive CS. I added yellow rhinestones to the centers. The sentiments are from SU More Merry Messages. 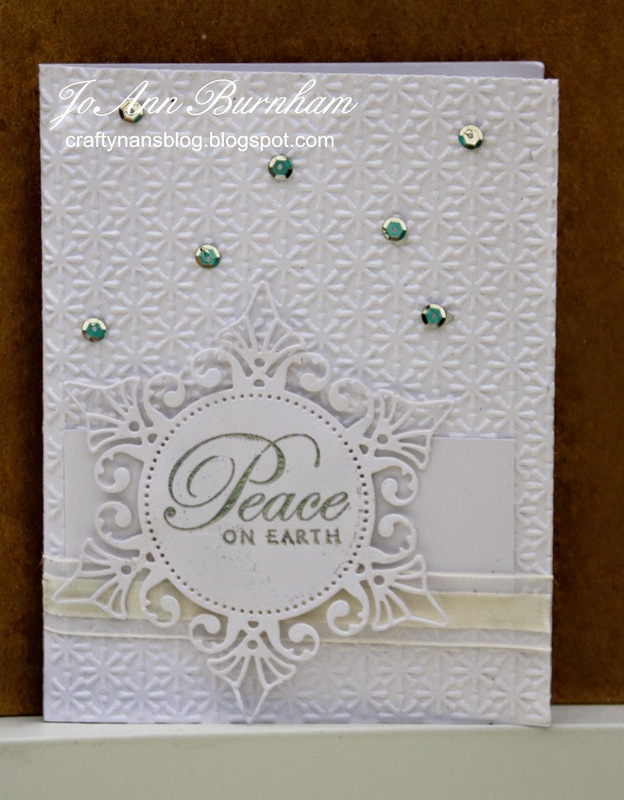 The Very Vanilla layer is embossed with The Paper Studio Holly Leaves EF. Here are close-up photos of the card and gift box. I used the negative border cut from the gift box to separate the layers on my card. Unfortunately I didn't have any goodies to put in the box, but it still turned out cute and will be perfect for a special little gift. I colored the sentiment with Old Olive and Real Red markers before stamping it. The flags are cut with MFT Fishtail Flags and Fishtail Flags Layers die-namics. Don't miss all the great projects by the other designers over on Christmas Stampin' All Year Long. Hope you will be inspired to play along with us. The card base and image panel are MFT Sweet Tooth. The image panel is cut with Spellbinders Classic Ovals die. I used SU Lucky Limeade CS for the large mat and LL ink for the leaves and the sunburst from SU Kinda Eclectic set. 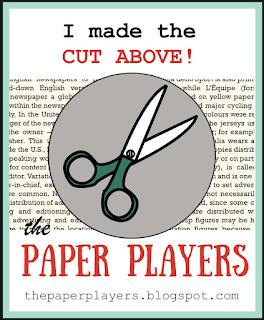 I fussy cut the leaves and cut them apart to place them where I wanted them. The lime stripe DSP is from American Crafts Dots & Stripes. 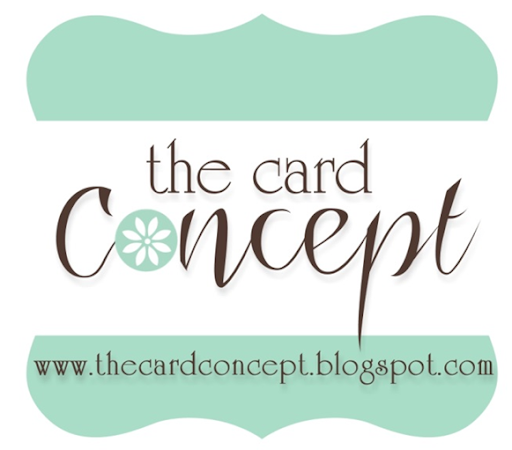 The scallop mat is SU Old Olive CS cut with Spellbinders Scallop Oval die. The flowers are from SU Flower Shop and Petite Petals and are stamped in Tempting Turquoise ink. 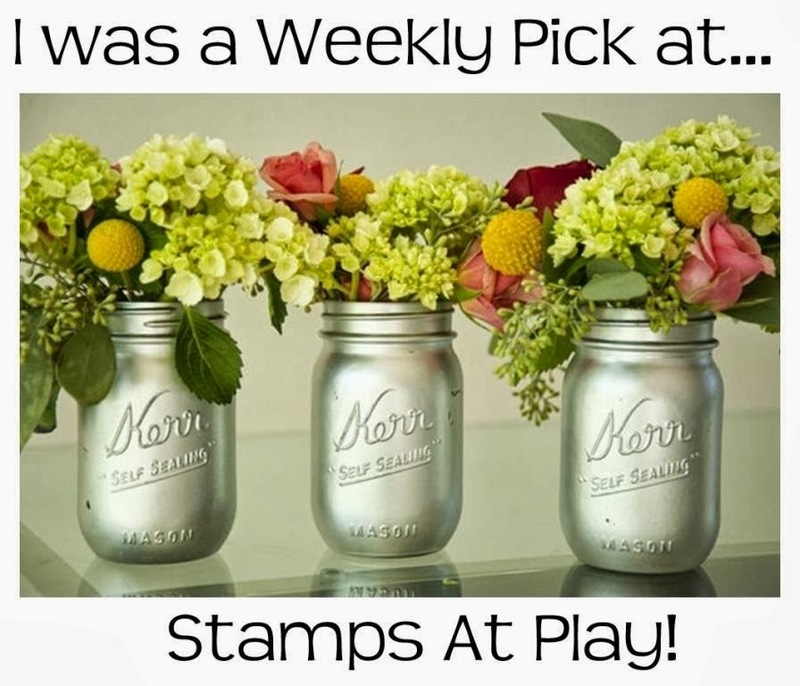 I stamped off once before stamping them so they wouldn't be so bright. I layered them with foam tape and added a pearl to the center. The Lucky Limeade ribbon is from last year's (?) SU Sale-a-Bration. 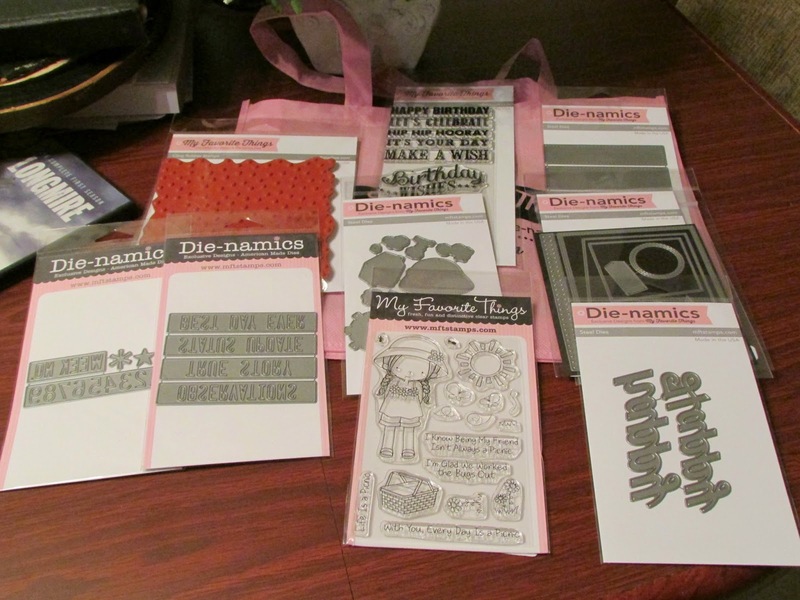 The sentiment from SU Simply Sketched is stamped in Basic Gray ink. 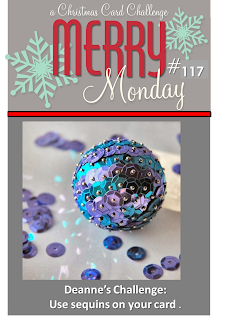 This is my card for Merry Monday #117 to use sequins on your card. I used red sequins on my Winter Wreath by MFT. I cut two layers from SU Garden Green and Old Olive CS and off-set them for a little more dimension. The DSP is from an older SU Merry Moments pack. I embossed it with the SU Decorative Dots EF. The sentiment is from SU More Merry Messages stamped in black and punched out with SU Large Oval punch. It is mounted on a Spellbinders Fancy Tags die-cut from Old Olive CS, and mounted on some pretty ribbon from my stash. The mat is Old Olive and the card base is SU Very Vanilla. Happy Friday morning my friends. It is time for another challenge over at Christmas Stampin' All Year Long and our sponsor this week is Pretty Paper, Pretty Ribbons. I am using the layered Christmas Tree from their "Winter Critters" cutting files and the red and tan paper from their "Vintage Christmas Circles & Spots" digital papers. I layered the parts of the tree, added glitter with a Gelly Roll Clear Glitter pen (which doesn't show up in the photo but is very pretty IRL) and then added some colored rhinestones for a little more bling. The sentiment is from SU Christmas Lodge set. I used a Real Red marker to just do the greeting and stamped each word separately and mounted with foam tape. The tree is mounted with foam tape also. 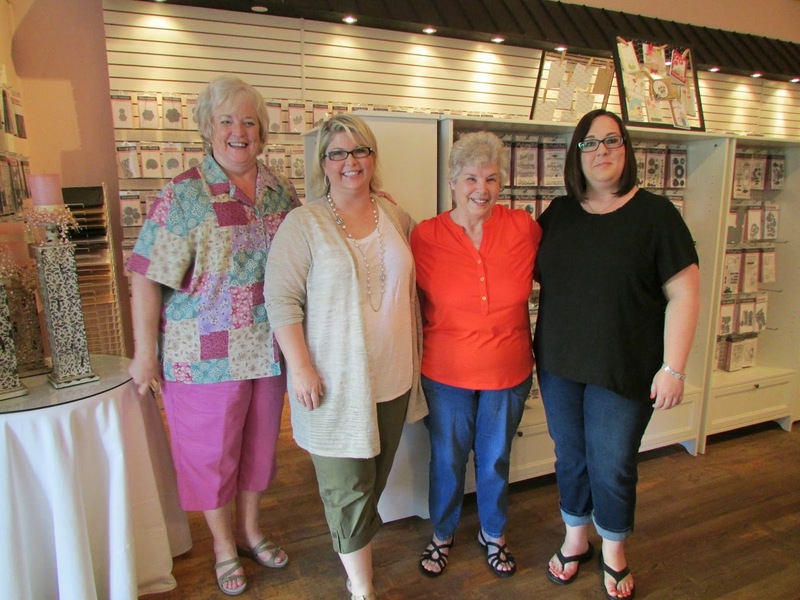 Now hop over to Christmas Stampin' All Year Long and check out the fabulous creations by the rest of the design team. Happy Thursday everyone. It is time for a new challenge at Seize the Birthday with the option of using "Twine or String" on your birthday project. 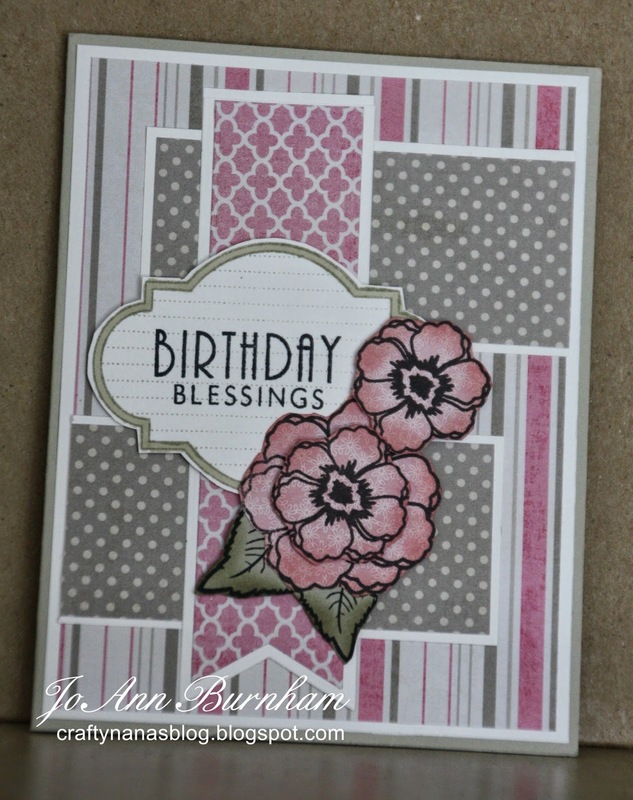 I used MFT Natural CS for the card base and the strip with the flowers on it. I stamped this panel with the MFT Linen Background stamp in SU Sahara Sand ink. The mats are SU Whisper White. The scallop border was punched with a SU border punch. The floral DSP is from Authentique's Latest and Greatest 6x6 pad. 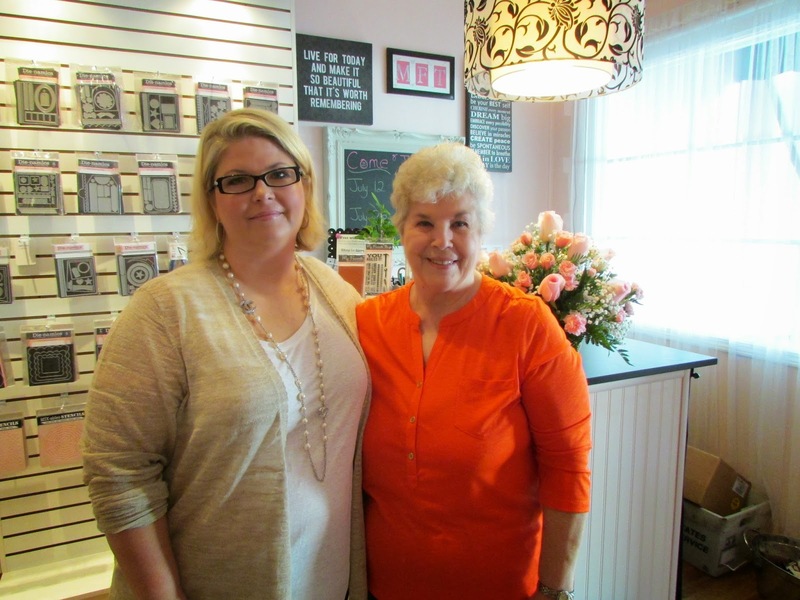 The flowers are from SU Flower Shop stamped in Regal Rose ink and then sponged lightly with the same ink. I stitched some pink thread through the buttons before adding them with glue dots, and then mounted then with foam tape. The leaves are from SU Stippled Blossoms in Wild Wasabi ink. I used my new Our Daily Bread Designs Pennant Swag 2 for the sentiment stamped in SU Marina Mist ink and cut it out with the matching Pennant Swag 2 die. I cut the ends off and added blue Baker's Twine bows and also glued the twine across the top of the pennants. I also added little pieces of foam tape behind each banner. Check out all the fabulous creations by my teammates over at Seize the Birthday. I hope you will be inspired to play along. 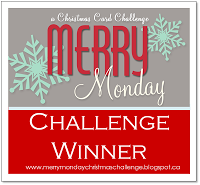 ETA: Yay, my card was an Honorable Mention at Merry Monday. 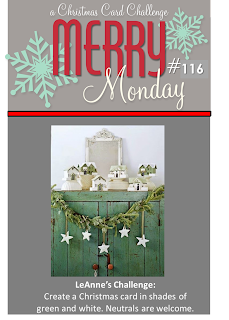 This is my card for LeAnne's challenge over at Merry Monday - Create a card in shades of green and white. 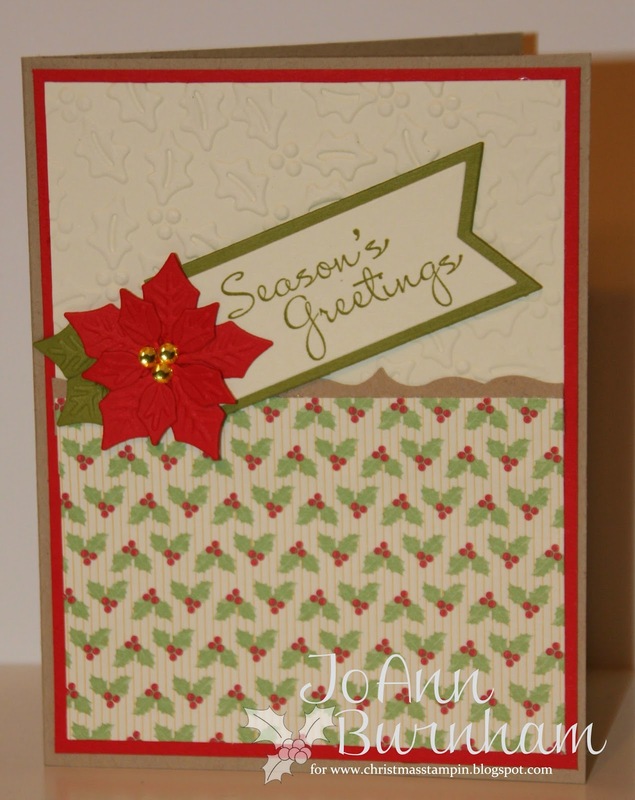 I used MFT Smooth White CS and SU Wild Wasabi CS, SU Gumball Green dotted ribbon and Gumball Green ink for the sentiment. The sentiment is from SU Many Merry Messages (retired). I embossed just the top portion of the white panel with SU Finial Press EF. 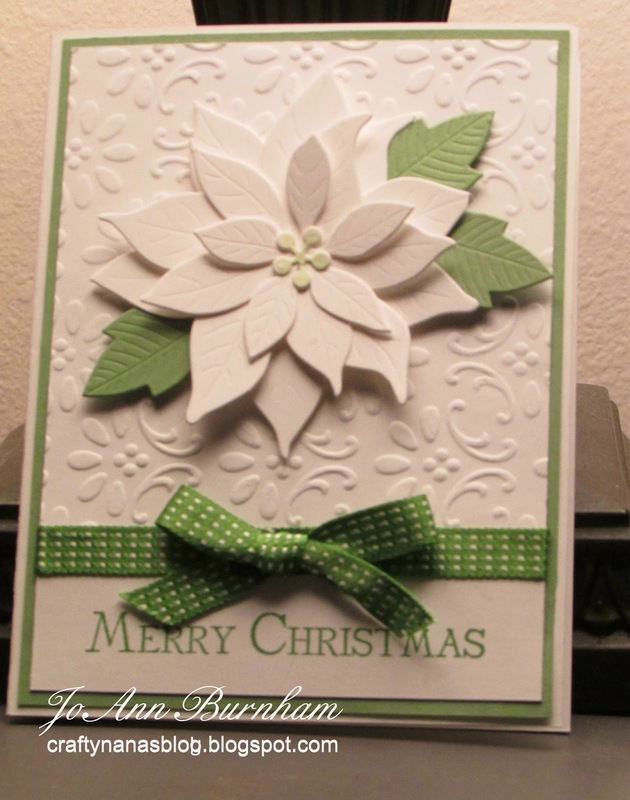 The poinsettia is from Poppystamps, Inc. Blooming Poinsettia die. I lightly sponged Certainly Celery ink over the center piece and mounted it with foam tape. Happy Friday morning friends. 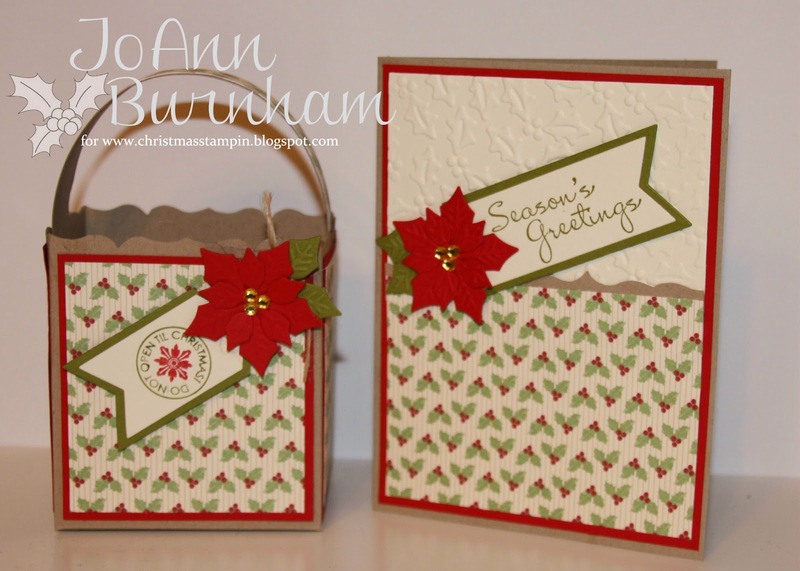 It is time for another challenge at Christmas Stampin' All Year Long. 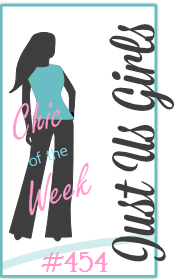 This week's sponsor is Eureka Stamps and it is "Anything Goes" - use 2 CS, 1 image, 2 embellishments, and 1 sentiment. For my card I used their "Clear Ornament" digi image, printed it on X-Press It Blending Card and colored it with Copics. I then embossed a cute snowflake with white embossing powder and cut the image out. I cut the hanger off and added gold cord as the hanger. The pine limbs are from SU Watercolor Winter and the sentiment is from Inspired by Stamping Festive Frames. 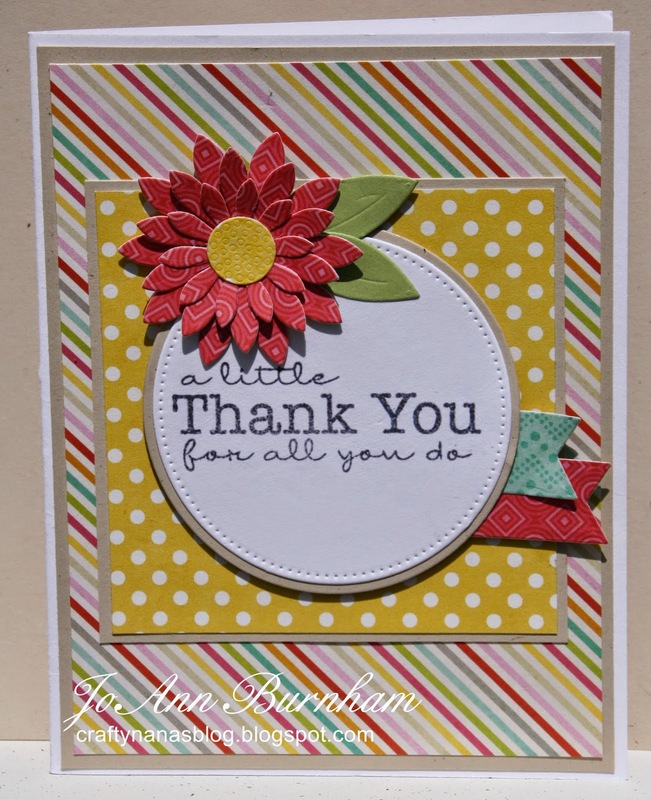 The DSP is from Lawn Fawn's Peace Joy Love 6x6 pad. The white panel is embossed with a Sizzix Snowflake EF. The card base is SU Cherry Cobbler and the mats are SU Basic Black. I added a Recollections enamel dot to the banner cut with MFT's Pierced Fishtail Flags die. 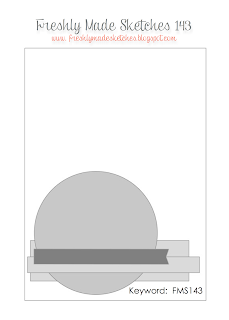 My layout is from Splitcoast Stamper's card sketch SC494, but used a rectangle shape instead of the circle. 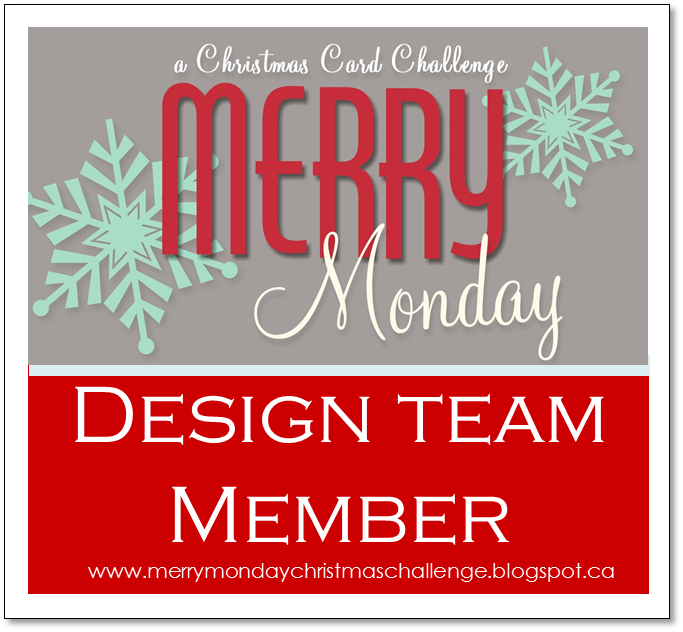 Now I hope you will check out all the great creations by my fellow designers over at Christmas Stampin' All Year Long and play along with the challenge. The winner of the challenge will get to choose 5 digi images from Eureka Stamps. I made this card for a good friend's daughter's baby shower this weekend. She is expecting a boy. The stork image is from a real old Close to My Heart stamp set, stamped in Mememto Tuxedo Black ink on X-Press It Blending Card and colored with Copics and fussy cut. It has several cute images and this one is perfect for a baby card. The sentiment is from Verve's "To The Moon" set stamped in SU Baha Breeze ink, punched with a circle punch and matted on a Spellbinders Scalloped Circle die cut. I paper-pierced the scallops. The DSP is from DCWV Nana's Nursery Baby Boy 6x6 pad. The card base is MFT Smooth White CS and the mats are SU Soft Sky CS. 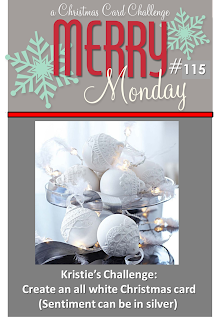 The challenge for this week's Merry Monday #115 is an all white Christmas card. 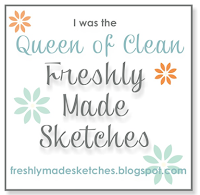 I used this week's Freshly Made Sketches #143 for my card. 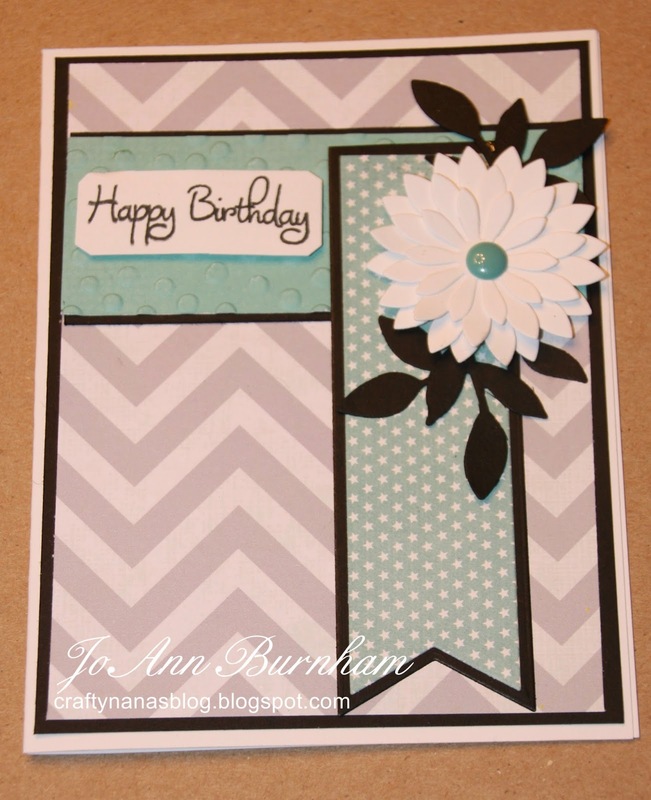 I used MFT Sweet Tooth CS and embossed the front of my card with SU Snowburst EF. I die cut the Spellbinders Venetian Motifs element and stamped the sentiment from SU Greetings of the Season with Versamark and embossed it with silver embossing powder. I added a piece of CS under the element and also SU Whisper White Organza ribbon, which I placed under the element instead of on top like the sketch and it looks like 2 layers. I hope this is o.k. as I didn't want to cover up any of the pretty die cut. In the photo, it looks yellowish, but it is white and very pretty IRL. Last, I added some sequins to some of the snowburst centers for a little extra touch. Happy 4th of July everyone. I hope you all have a happy and safe weekend. 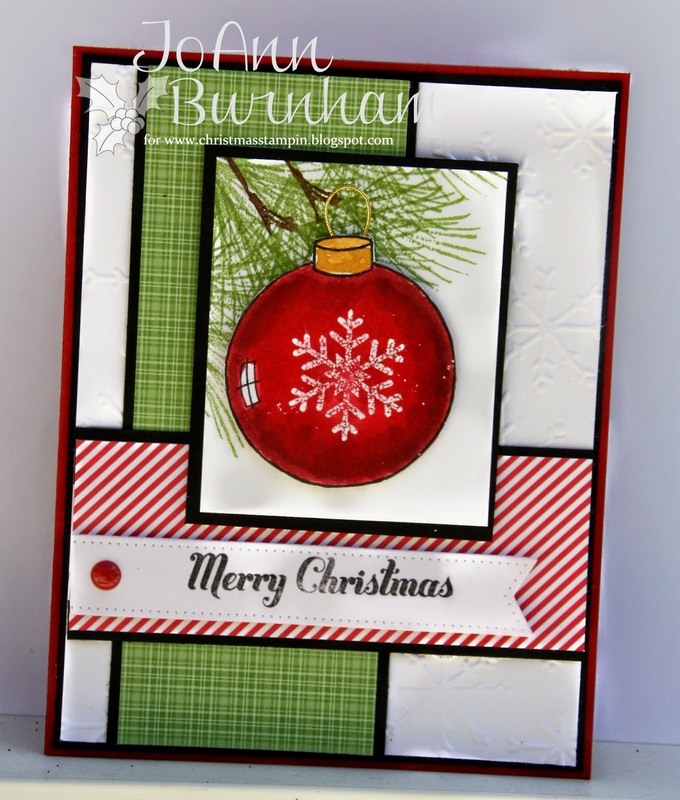 It is Friday and time for another Christmas Stampin' All Year Long challenge. 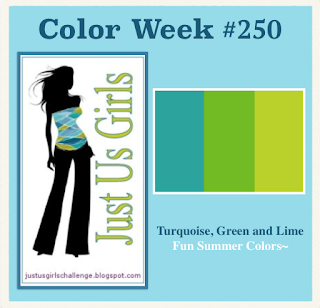 It is "Anything Goes" - use your favorite color choice. Our sponsor is Emma Canning and the winner will receive 5 digi images of their choice. 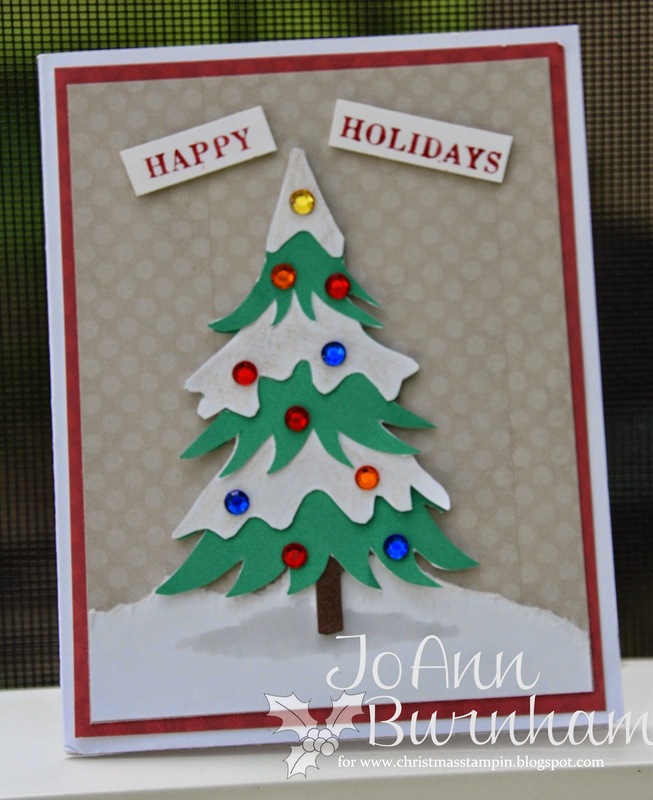 Here is my card and I am using "All Lit Up" digi image by Emma and red and green as my favorite Christmas colors. I printed the image on X-Press It Blending Card and colored her with Copics. She is cut out with Spellbinders Classic Ovals and matted with Spellbinders Lacey Ovals in SU Real Red CS. I sponged SU Bashful Blue ink aroud the image while still in the die. The green plaid DSP is from DCWV Christmas Mat Stack and the red check is from my scrap pile. The sentiment is from My Favorite Things PI-Happy Christmas stamped on a banner cut from MFT Fishtail Flags Stax. I added 2 red enamel dots by Recollections. 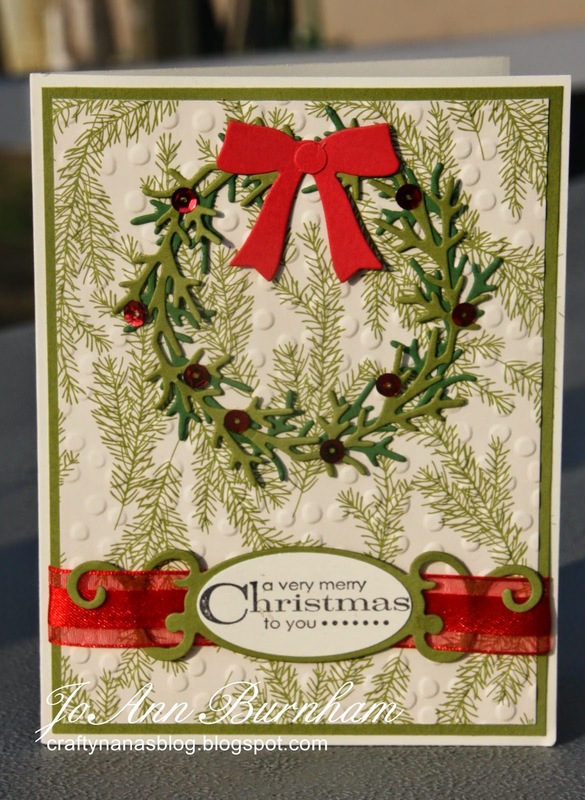 Now hop over to Chrstmas Stampin' All Year Long and check the great cards by the designers. 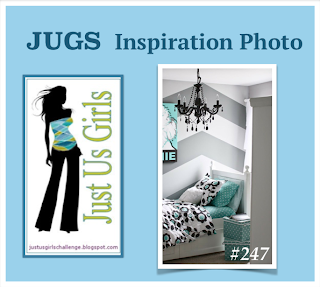 This is my card for Just Us Girls Challenge #247, which is a photo inspiration challenge this week. I used an older sketch from Pals Paper Arts #208. My card base is MFT Sweet Tooth CS and the mats are SU Basic Black CS. The gray chevron and aqua papers are from Heidi Swapp Make It Pretty pad and the printed aqua paper is from MME Happy Day 6x6 pad. I embossed the solid aqua with SU Decorative Dots EF. 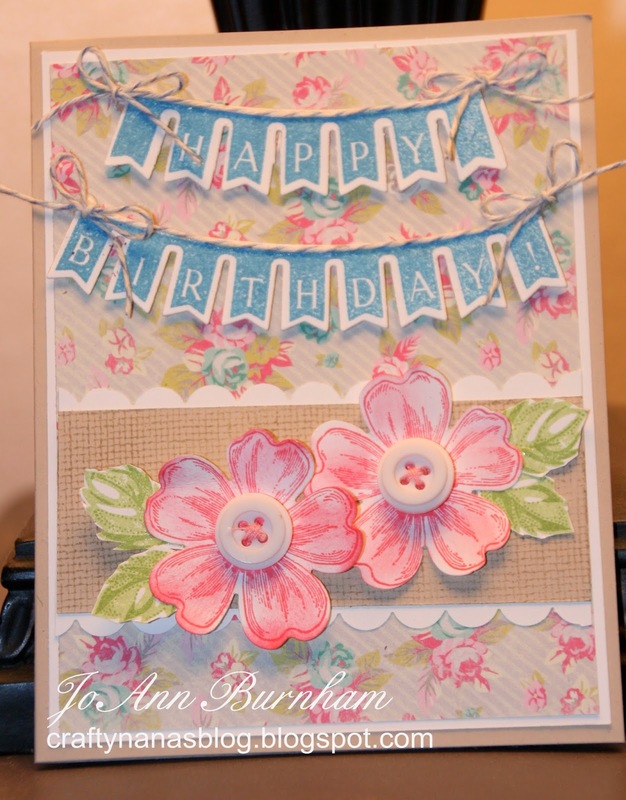 The flower is cut with MFT's Upsy Daisy die and the banner is cut with MFT's Fishtail Flags and Fishtail Flags Layers dies. The leaves are from SU Sizzlet Little Leaves die. The sentiment is from Birthday Balloons Jolinne (retired). The daisy and sentiment are mounted with foam dimensionals. I used the Viva la Verve June Wk 3 sketch. And as you can see, I used both stars (stamped and punched) and stripes (in the patterned paper and one of the stamped stars). The DSP is from the new SU All Abloom stack and the CS is SU Strawberry Slush, Daffodil Delight and Whisper White. 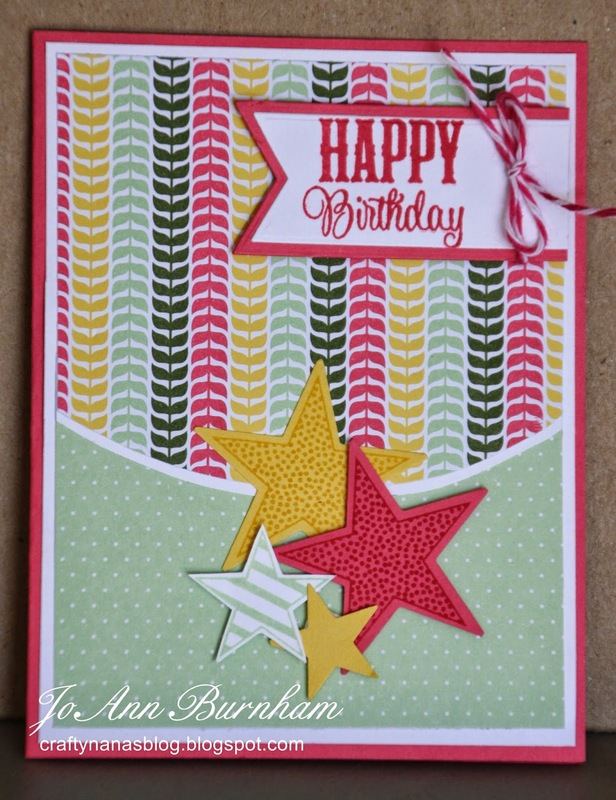 I used Verve's Seeing Stars and Chevron Love for the sentiment stamped in Strawberry Slush ink. The stars are stamped in Daffodil Delight, Strawberry Slush and Pistachio Pudding inks. I added some Baker's Twine around the sentiment banner. 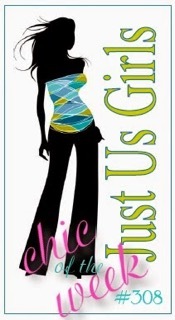 The banner is cut with MFT Fishtail Flags and Fishtail Flags Layers die-namics. The stars and sentiment are mounted with foam dimensionals. Now you need to check out all the fabulous creations by my teammates over at Seize the Birthday. I hope you can play along with us, can't wait to see all your creations. I made my card for a friend using Viva la Verve Jun Wk 4 sketch. The card base is SU Sahara Sand CS and Whisper White mats. The DSP is from Recollections Little Princess Pad. I used 3 Verve stamp sets: the flowers (one of my favorites) is from One Person (retired) stamped on DSP. The leaves are stamped on Sahara Sand CS. The sentiment is from On Occasion and the label is from Love Notes and stamped in Sahara Sand ink. The sentiment panel and flowers are mounted with foam dimensionals. 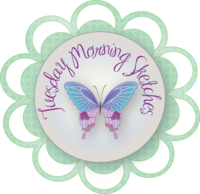 I am playing along with the My Favorite Things Weekly Sketch Challenge #182 this week. I rotated the sketch to fit my image. I used this cute PI Wish You Were Here stamp that I got during my visit to the My Favorite Things Boutique this past Saturday (so much fun). I stamped her in Mememto Tuxedo Black ink on X-Press It Blending Card and colored her with Copics.I also used the Linen Background stamped in SU Pink Pirouette ink on my banners - it is a subtle effect. The banners were cut with MFT Fishtail Flags Layers Stax die. The card base is MFT Smooth White CS, the mats are SU Pretty In Pink. the blue DSP is SU Bashful Blue and the printed DSP is from DCWV Spring Mix Stack. The image and sentiment panels are mounted with foam dimensionals.